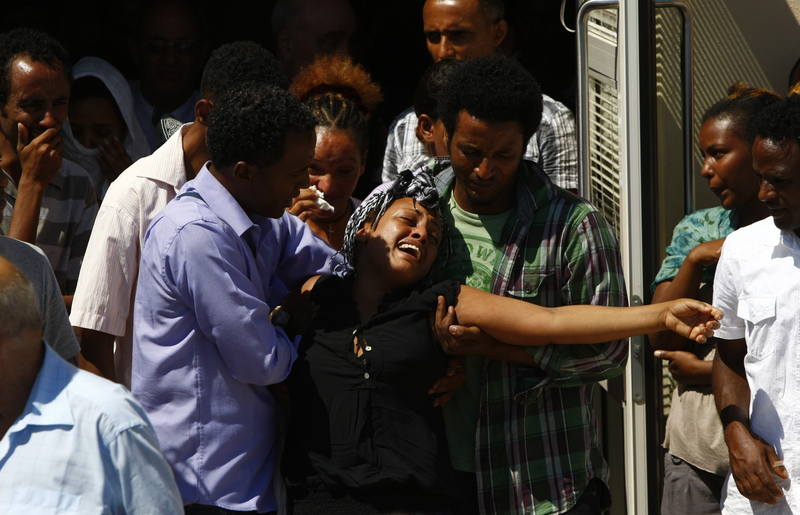 Selemauit Hagus Belay (C) of Ethiopia cries as a hearse carrying the coffin of her Eritrean husband Ashih Tekleab Haile leaves Mater Dei Hospital outside Valletta July 26, 2011. Ashih, who arrived in Malta as an asylum seeker with his wife in 2009, drowned on July 20 after rescuing a French tourist from drowning in rough seas. The Maltese government subsequently announced it would amend a law to enable it to award Ashih a posthumous medal for bravery, which at the time was only available for Maltese nationals. Photographing funerals is always a very sensitive and emotional affair. Though we had been invited by the Emigrants’ Commission and by the family of the deceased. I wanted to keep a respectful distance, so I stood on a wall outside the hospital mortuary and waited for the mourners to come out.